Your baby has grown so fast! Can you believe that a year has already gone by?. With an improved AI your baby will react as if they were in the room with you. You have to take care of your baby. 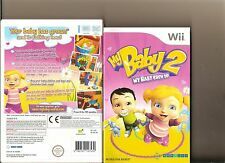 Interact with your baby by talking to him or her and using your Nintendo Wii remote to make them act like a real baby. Cake Mania In The Mix. Customize Jill's bakeries with 50 unique kitchen upgrades - Ovens, Shoes, Frosters, Display Stands, Cookie Ovens, TVs, Toppers and Frosterators. A Fish Tank, Tables and Benches are new to the Wii version! Nintendo WII:Animal Crossing - Let's Go To The City (big box set). The big box edition includes a "WII Speak" device. UK PAL version. The pictures show the actual item for sale. MY BABY 2 MY BABY GREW UP WII. BABY SIMULATOR. TEACH THEM TO EAT,DANCE ,WALK AND MORE. Title: Petz Sports: Dog Playground (Wii). Title : Petz Sports: Dog Playground (Wii). Platform : Nintendo Wii, Nintendo Wii. Condition : Good. List Price (MSRP) : 19.99. Release Date : 2008-11-14. NINTENDO WII. MY BABY 2: MY BABY GREW UP. Your baby has grown so fast! Can you believe that a year has already gone by?. NEW & SEALED CONDITION COMPLETE . Animal crossing Wii - PAL. Nintendo Wii game The Dog Island UK boxed. Condition is Like New. Dispatched with Royal Mail 1st Class Large Letter. Nintendo Wii game The Dog Island UK boxed. Condition is Good. Dispatched with Royal Mail 1st Class Large Letter. Ready, Steady Cook (Wii). Title:Ready, Steady Cook (Wii). All of our paper waste is recycled within the UK and turned into corrugated cardboard. Your item will be previously owned but still in great condition. Title: Ready, Steady Cook (Wii). Title : Ready, Steady Cook (Wii). Platform : Nintendo Wii, Nintendo Wii. Condition : Good. List Price (MSRP) : 14.99. Release Date : 2009-08-14. Trauma Center: New Blood (Nintendo Wii, 2008) European Version. Complete in Box! 4 out of 5 stars - Trauma Center: New Blood (Nintendo Wii, 2008) European Version. Complete in Box! 2 product ratings2 product ratings - Trauma Center: New Blood (Nintendo Wii, 2008) European Version. Complete in Box! Cake Mania: In the Mix (Wii). Title:Cake Mania: In the Mix (Wii). All of our paper waste is recycled within the UK and turned into corrugated cardboard. Your item will be previously owned but still in great condition. Title: Cake Mania: In the Mix (Wii). Title : Cake Mania: In the Mix (Wii). Feature 3 : Customize Jill's bakeries with 50 unique kitchen upgrades: Ovens, Shoes, Frosters, Display Stands, Cookie Ovens, TVs, Toppers and Frosterators. Platform : Nintendo Wii, Playstation 3. Condition : Good. List Price (MSRP) : 24.99. Genre : simulation. Release Date : 2011-03-18. Platform : Nintendo Wii,Nintendo Wii. Condition : Very Good. Part # : Unknown. Genre : adventure. DVD'S & FILMS. Samba De Amigo. For The Nintendo Wii Console And The Nintendo Wii U Consoles. This is in perfect working condition. Box (good condition, general wear). Wii - G1 Jockey 2008 (boxed) (used). G1 Jockey 2008. Language is German. Pattern picture! Item may differ from the photo. The Konsolenkost-Team wishes you a lot of fun. boxed, used. Item may differ from the photo. Wii - Trauma Center: Second Opinion (boxed) (used). Trauma Center: Second Opinion. Language is German. Pattern picture! Item may differ from the photo. The Konsolenkost-Team wishes you a lot of fun. Wii - Sim Animals (boxed) (used). Sim Animals. Language is German. Pattern picture! Item may differ from the photo. The Konsolenkost-Team wishes you a lot of fun. boxed, used. Item may differ from the photo. Wii - Animal Crossing: Let's go to the City (only Software) (EN/GER) (boxed) (used). Animal Crossing: Let's go to the City. Language is German. Pattern picture! Item may differ from the photo. The Konsolenkost-Team wishes you a lot of fun. Trauma Centre Second Opinion. For The Nintendo Wii Console And The Nintendo Wii U Consoles. This is in perfect working condition. On the farm life!Freshly arrived on the new island, you quickly realize this revive once place, seems to have many problems. The mystical mother tree, which watched over the island, gives no sign of life more by themselves. Skylanders Giants (USB Portal Base Required To Play Other Characters, Characters And Base Sold Seperatly). For The Nintendo Wii Console And The Nintendo Wii U Consoles. This is in perfect working condition. Pony Friends (Nintendo Wii, 2007) - BOXED IN EXCELLENT CONDITION!! !